Bison’s flavor is beefy, but its flavor also has some notes in common with other game meats like venison or elk. Here we’ve paired it with a cherry, port wine sauce that compliments both aspects of its personality. 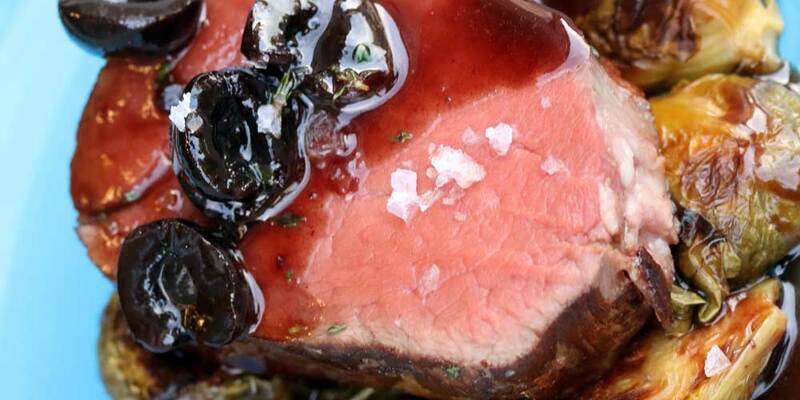 Because bison is so lean, cooking it sous vide can help it stay moist. However, you could easily adapt this recipe for roasting the tenderloin portion in the oven or cutting it into steaks for faster searing. Preheat your sous vide bath to 120°F. Season the tenderloin portion with salt (less than you would use when searing or roasting) & vacuum pack it. Cook the bison sous vide for 2 hours. Toward the end of the bison cooking time, preheat your oven to 400°F. Toss the Brussels sprouts with their olive oil & salt, spread them out on a baking sheet, and roast them until tender. Remove the bison from the sous vide bath & the vacuum bag. Dry it off, then briefly sear it in a hot, oiled pan over high heat. You want to brown each side without cooking the interior any further. Deglaze the pan with the beef stock and ruby port. Stir in the luxardo cherries & syrup, then bring the liquid to a simmer. Simmer the liquid until it has reduced by 1/3rd. Swirl in the 2 tablespoons of butter until melted in, then stir in the red wine vinegar. 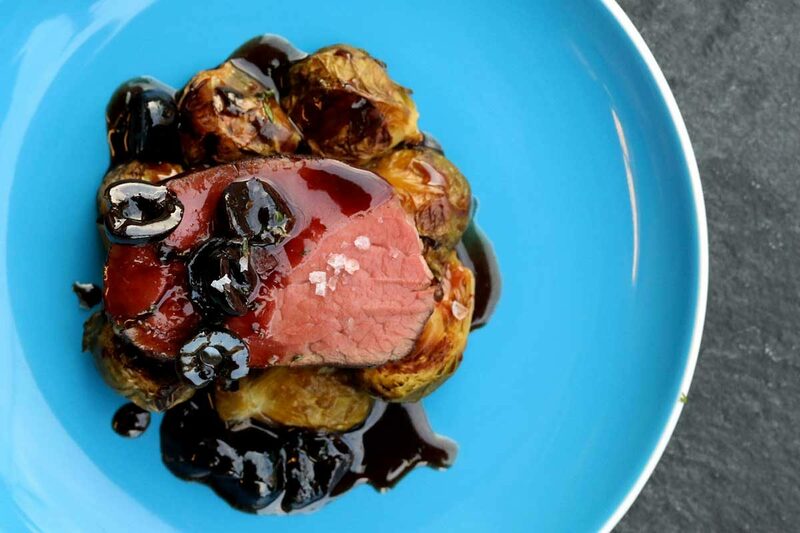 Slice the bison tenderloin & serve it with the Brussels sprouts, drizzled with the sauce & cherries.